Sainsbury’s and Asda are likely to have to sell one of their Charlton stores if the two supermarket giants are allowed to go through with their plans to merge, according a report from the competition watchdog. The two superstores are among 629 locations where a tie-up between the two companies could result in a “substantial lessening of competition”, the Competition and Markets Authority said in a provisional report on the merger plan, released on Wednesday. The two supermarket giants announced plans for a tie-up last April, and it has been widely reported that the combined company would take one pound out of every three spent by UK grocery shoppers. But the CMA says a combination of the two firms could mean shoppers would “face higher prices, reduced quality and choice, and a poorer overall shopping experience across the UK”. While the strength of the CMA’s concerns about the merger could force the two companies to abandon their plans, Sainsbury’s and Asda have said they want to go ahead with the tie-up. The full report was made public on Thursday afternoon. As well as the two Charlton stores, the CMA has raised issues about stores in Lewisham, New Cross, Abbey Wood, Kidbrooke, Peckham, Deptford, Old Kent Road, Isle of Dogs, Bexleyheath and Belvedere. Both retailers also have petrol outlets within close proximity of each other, as Sainsbury’s retailed the filling station from its former Greenwich store, now replaced by an Ikea. These outlets are also highlighted by the CMA. As well as their two Bugsby’s Way superstores, Sainsbury’s also has a Local supermarket on Charlton Church Lane. This is not included in the CMA’s list of concerns. Of the two Charlton superstores, the Asda branch is arguably the most vulnerable to a sale. The store has been trading for 35 years, making it the second oldest in the Charlton retail area (Makro is 10 years older) and its facilities are dated. It could be seen as a target for Lidl, which is currently applying for planning permission to convert two units in an adjacent shopping park into a supermarket, or the new Tesco low-cost brand Jack’s. The Charlton store only opened in 2015, and there have been anecdotal reports that trading has been slower than expected – one consequence of its move from east Greenwich was that the store was cut off from shoppers who would take a bus down the hill from Blackheath. But a new store could be attractive to a rival such as Morrisons, which lacks a store between Peckham, Welling and Thamesmead. The full Competition and Markets Authority report will be released in April. Some local blogs do the opening of new pop-up boutique vintage street food cat cafes. In Charlton, we get to do whacking great supermarkets. 16 years ago, Jamie Oliver opened the “eco” Sainsbury’s at east Greenwich. That store closed without ceremony last night, and the supermarket giant has reopened a mile down the road, in a less impressive building. Today’s opening didn’t have anyone off the telly there, but it did have new local MP Matt Pennycook and Greenwich Council’s regeneration cabinet member Danny Thorpe on hand for the inevitable photocall for weekly council rag Greenwich Time. Maybe Danny Thorpe brought up the matter of the store flouting planning rules over its giant signs? Who knows. Doubt you’ll read any of that in Greenwich Time. With a brief apology for keeping us all waiting, the store opened to the public at the stroke of nine o’clock. So what’s it like inside? Well, there’s a greater emphasis on homeware, electricals and clothing. And it’s a bit weird walking through a perfectly-stocked supermarket where nobody’s bought anything yet. In short, it looks like any other supermarket. What did you expect? But it’ll be a rude shock for those used to the curved lines and natural daylight of the Greenwich store – likely to be flattened and replaced with an Ikea, although the Swedish furniture giant doesn’t have detailed planning permission yet. So, how will the new store do? It’ll certainly lose some custom in the short term – Transport for London has refused developer funds to help extend bus route 202 from Blackheath to the new store, and many Greenwich Millennium Village residents may decide it’s a schlep too far. With the trends towards home delivery and smaller stores, it’ll be interesting to see how things pan out. A wider range of goods may encourage customers to stay longer. It’s worth noting this new store is not a 24-hour branch. And with the newish Sainsbury’s Local on Charlton Church Lane thriving, the chain is clearly hedging its bets. How the new store fits in with its surroundings is an issue. I’m not sure it stands up to past promises made to local groups. Rat-running and traffic is likely to be a problem. Access isn’t particularly cycle-friendly. And the new pedestrian crossing – which appears to be in the wrong place – has been already been hit by a driver. But the next part of the story comes in a couple of weeks – for M&S is opening on 9 July. It’s likely this retail complex will be both a benefit and a burden – just how much of each, we’ll see in the weeks and months to come. A week to go until the new Charlton Sainsbury’s opens (9am on Wednesday 24 June, with M&S due to follow three weeks later), but there had been a set-back for the supermarket – Greenwich Council refused plans to stick a giant four-metre high illuminated logo on the store roof, along with a smaller sign by Bugsby’s Way and a totem facing Woolwich Road. Except that this week… a giant four-metre high sign has appeared on the store roof, along with a smaller sign by Bugsby’s Way and a totem facing Woolwich Road. No, we don’t know what’s happening either. Nor are we quite sure why the next door M&S also features a whacking great big sign (our best guess is it may not have needed permission as it’s partly below roof level). But we are trying to find out. Of course, there are bigger issues with a whacking great big supermarket in a residential area – traffic, wasted space, and the building’s very existence when we desperately need new homes. But if the small things (such as a sign) can’t be fixed, what hope is there for the big things? Thanks to Pete M for the tip-off. 4.20pm update: A very quick response from Greenwich Council, which says it has opened investigations into both the Sainsbury’s and M&S signage. 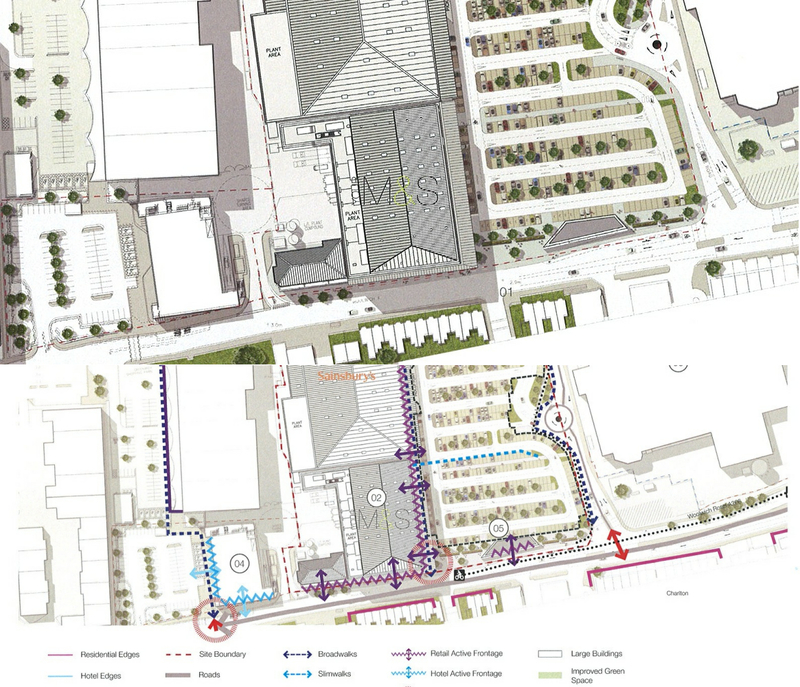 18 June update: Greenwich Council’s confirmed the M&S sign does have planning permission, given last December. Final work is taking place at Charlton’s new Sainsbury’s/ M&S complex, which will come to life in six weeks – the ‘old’ Greenwich Sainsbury’s set to close on Tuesday 23 June with its Charlton replacement opening its doors the following the day. Some bits of work still need to be done, though – such as signage. 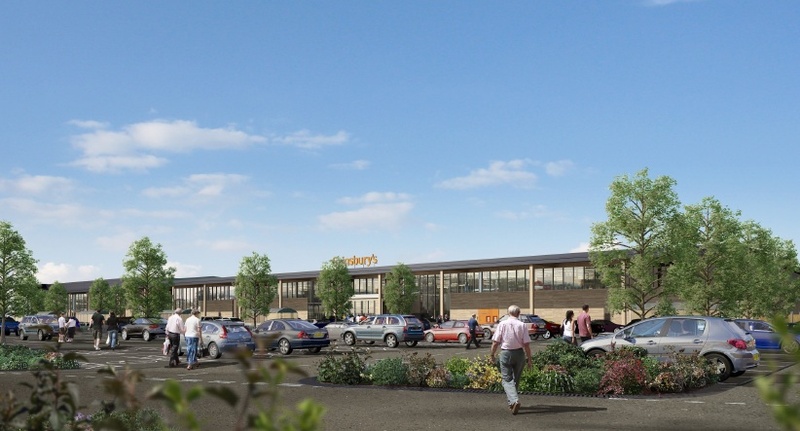 If you’re expecting the new store to have subtle signs, think again – a giant four-metre high Sainsbury’s logo is due to be plonked on the roof of the store, according an application sent to Greenwich planners. It’s a far cry from the more subtle sign that sits below the roof level of the Greenwich store – an image of which is still being used on recruitment ads for the new outlet. It’s been a long while coming, but councillors finally voted last night to back plans to to move Greenwich’s Sainsbury’s to Gallions Road, Charlton, in a new site along with an M&S and other shops. Greenwich Council’s planning board voted 8-1 in favour of the application, despite concerns about traffic congestion and air pollition on Woolwich Road. As well as the two superstores, the scheme will provide 850 jobs as well as a “high street” frontage of other stoes in front of the Rose of Denmark pub. One councillor, Steve Offord, was heckled by members of the public for saying it was “inevitable” that the council would have to accept drivers entering the complex from Woolwich Road. Local campaigners had argued that customers should have to use Bugsbys Way, to tak traffic off the A206. Council leader Chris Roberts suggested a compromise solution, where a fund of money from the developer should be set aside for traffic improvements after the store had opened, to calm fears of rat-running on Victoria Way and other streets. He also backed calls for a second entrance to Charlton station on Troughton Road, although this is subject to a separate process. The only dissenting councillor was Kidbrooke with Hornfair Labour representative Hayley Fletcher, who acknowledged the scheme had great promise but was full of “missed opportunities” to promote sustainable transport on the Woolwich Road, dubbing the air quality statistics in the area “frightening”. Most speakers were in favour of the development, but many were sharply critical of the lack of measures to control traffic. Developer LXB said it had offered Transport for London money to extend bus route 202 from Blackheath Standard to the store, to compensate people who would usually take the 108 service to the Greenwich store, but TfL insisted the bus network was fine as it is. Chris Roberts suggested the council should take a tough line with TfL on the issue, adding that existing route 129 was only created thanks to a planning application put in for the Millennium Dome. To see short summaries of what was said during the meeting, see this Storify round-up. The new store is likely to open in 2015. 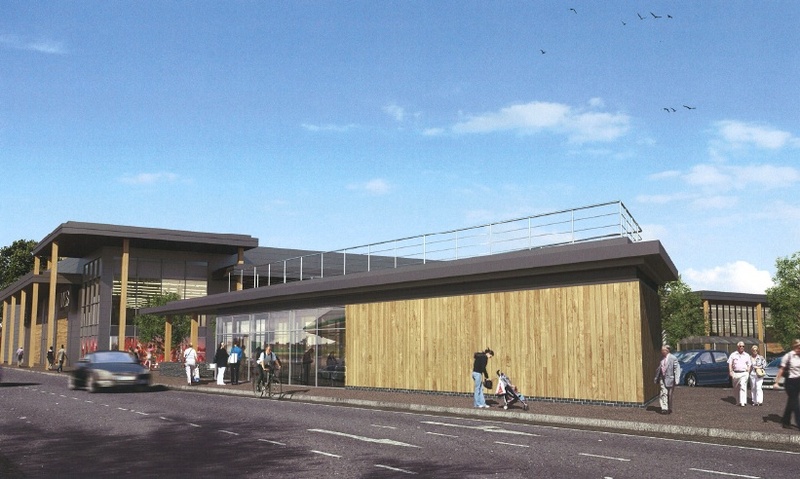 Detailed plans were released this week for the proposed Sainsbury’s and Marks & Spencer stores, set to be located within Charlton’s retail park. These images form part of developer LXB‘s application to Greenwich Council. A planning board will then decide whether to approve or reject these plans – likely to be some time in June. Their reasoning behind this are the new developments in Woolwich, such as the Tesco, that WYS believes will regenerate the SE18 area, keeping shoppers from getting into their cars or straying onto a bus and travelling over to Charlton. Another talking point recently has been the downgrade of the western end of Woolwich Road (from Charlton station to the flyover) and how these new developments will impact on the near 24,000 vehicles that use the road on an average weekday. An equally in-depth report by transport specialists Vectos makes no mention of this, however. It references the draft supplementary planning document that appeared in January. But doesn’t take into account the changes made for the finalised version that states clearly a wish to downgrade the road. This website understands the developer LXB have been told by TfL and the council’s highways department that alterations to plans won’t be considered until the road has actually been downgraded. Meaning, the proposed reshaping of Woolwich Road for deliveries and customer access (including current work being undertaken for the Travelodge) don’t take this downgrade into account. This agreed Charlton Riverside Masterplan also calls for an upgrade to Charlton station which would surely mean a re-think on the junction next to it. Would it be outrageous for me to suggest that a coherent plan for Woolwich Road, using a bit of foresight, might save a lot of time, money and upheaval in the future? 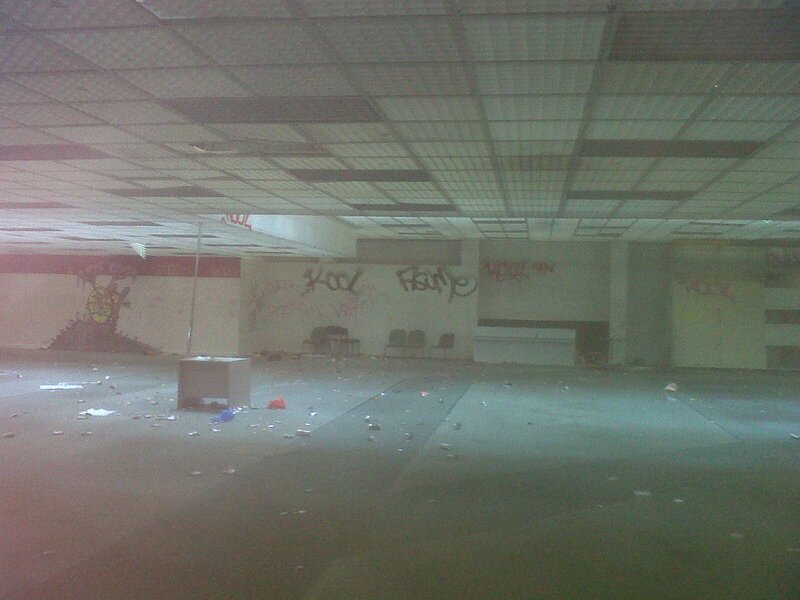 The old retail barns that currently occupy this site lay dormant, aside from the odd illegal rave. Wickes is the last store still operating and is believed to be moving into its new home next to Matalan in the next two weeks. If approved by the council’s planning board the new Sainsbury’s and Marks & Spencer would be looking to open before the end of 2014. Members of the public can comment on these proposals and view all the documents by visiting Greenwich Council’s planning website.